Longreach is a sizeable town in outback Queensland. 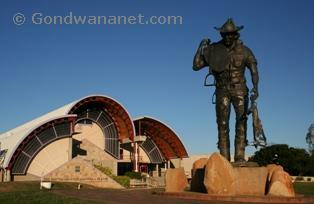 Longreach is one of the most visited towns in outback Queensland. It has got two attractions found nowhere else in Australia: the Qantas Founders Outback Museum, and the Australian Stockman’s Hall of Fame. But there is also an interesting Powerhouse Museum, the School of Distance Education, and the enjoyable outback experience in Banjo’s Pioneer Shed. The central tourist information centre, post office, shops, eateries and places to stay are in the blocks around the crossroad of Duck and Eagle Streets. West from the town centre is the Powerhouse Museum – the town's’s former powerhouse which was in use until 1985. 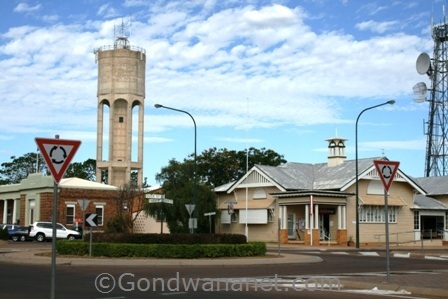 The rest of tourist attractions are away from the town centre, east along the Landsborough Highway. About 2km out of the town is the Australian Stockman’s Hall of Fame & Outback Heritage Centre - a very popular outback attraction. It’s huge and it’s full of interesting displays about the history of Australian Outback, its people, work and play, and the ticket is valid for two days so you can return the following day for no extra cost. 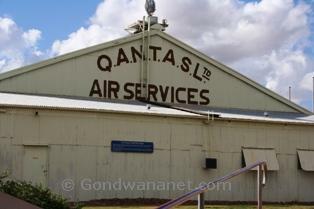 Longreach’s was the birthplace of Qantas Airlines. The original hangar is here, now as a part of the Qantas Museum at the town's Airport, just north of the Hall of Fame. Inside the hangar are an old workshop and an airplane, Apollo, which was the first covered aircraft of Qantas. In the museum next door, there is Avro – the first Qantas airplane ever. 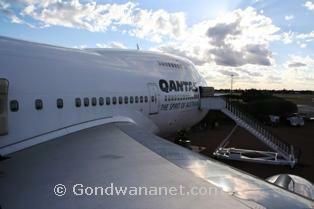 Also in the museum are displays about the history of Qantas, old photos and different memorabilia. Outside the museum is a new attraction which has only been here since 2002. It’s a modern Qantas 747 Jumbo Jet, which you can discover up-close on a tour which takes you inside the plane, to engine rooms, storage room, petrol tanks and even to the cockpit where you can sit in the pilot’s seat and be taught how to drive a plane! It’s very interesting, you’ll learn how to start it, how to turn and adjust speed, and finally you can go out and walk on one of the wings where you can have a photo taken. And – it’s not any Qantas plane – what’s special about this particular airplane is that its last trip was to bring home the victims of Bali Bombings in 2002. It was then decided to take the plane here and turn it into museum. 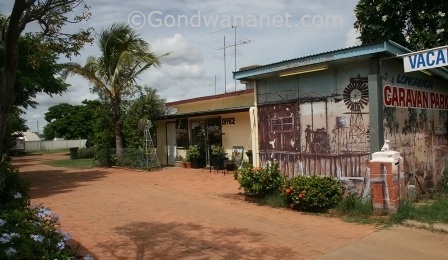 Another interesting place to visit while in Longreach is the School of Distance Education. Such schools are found in many parts of Australia where the isolated cattle stations are not in a reachable distance to a school, so the kids are taught from the School of Distance Education where lessons are given over radios and computers. The one in Longreach teaches about 200 children in the area around the town, and many times a year the children get together and learn to know each other and their teachers. Teachers also visit homes and the students are of course welcome to the school any time they happen to be in town – there are computer rooms in the school and there are always some students using them. You can go on a guided tour where you can see teachers in the action and hear the children in the other end. 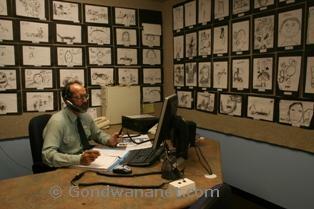 The walls are covered in children’s drawings and there is also a mural outside with the pupils’ names. 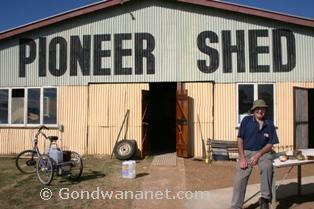 South of the School of the Distance Education, Outback Hall of Fame and the Qantas Museum is a unique outback experience – Banjo’s Pioneer Shed & Outback Theatre. It’s all based on the history of the outback life with humour, songs and yarns of the outback characters. Banjo, his wife Robyn, and his friends Andy and Ron put a show on and tell you the outback stories, sing songs, shear a sheep and press the wool on a 110 year old wool press. Dinner, lunch or breakfast is included in the price and fresh products come from their own veggie garden. During the colder winter months they put on a fire and billy tea, and there is even a book exchange and a gift shop. Good, friendly people and a very enjoyable experience. Some places to stay include Abajaz Motor Inn, Albert Park Motor Inn, Aussie Betta Cabins, Commercial Hotel, Longreach Motel, Longreach Motor Inn, Old Time Cottage and the old "Town Lodge". If you are camping, there are Longreach Caravan Park, Discovery Holiday Park, and a free camping area next to the river, just outside the western end of the town. Here's an Australian outback map showing the town, where I have tagged the places that I mentioned on this web page. You can click on the tags to see what places they are, and double-click anywhere on the map to zoom it in and see the places closer. Drag the map to move around, and if you want to see the satellite image with Google Earth, click on "Sat" in the top right hand corner.